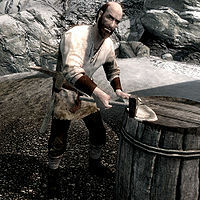 Leigelf is a Nord miner who owns the Quicksilver Mine in Dawnstar. He is married to Beitild, the owner of Iron-Breaker Mine. Although the couple lives in separate houses, their relationship has turned into a feud, to much regret of their workers. He will buy any quicksilver ore that you bring him. Leigelf owns a house in the center of Dawnstar and sleeps there every night between midnight and 6am. After a one-hour breakfast on his porch he goes back to bed for another hour. At 8am he heads up to his mine and spends the day working the smelter alongside his employee Lond, interrupted only by one-hour meals on the porch at noon and 7pm. At 8pm he heads back to his house where he wanders around until bedtime. He wears a set of miner's clothes and a pair of boots, and is equipped with a pickaxe. He carries a key to his house and a selection of common loot and gold. When you greet him, he may say things like: "Quicksilver Mine is the best mine in Dawnstar, and you can tell those Iron-Breaker miners I said so." or "If it's about the mine, I'm all ears." If Beitild is dead he may say: "My wife Beitild is dead. Can't say I miss that old sabre cat." If you have not completed the quest Waking Nightmare, he can be found saying: "What is it? I haven't had much sleep." He will then elaborate on his sleep issues: "It's these nightmares. Me and every one of my workers can't catch a nod without having one. They're almost... real. They say a priest of Mara has arrived in town. We'll see if faith can cure this curse." If you approach him for work, he will offer you some: "If you don't mind digging, I own the Quicksilver Mine. It's a better life than working in that damned Iron-Breaker Mine with all those milk drinkers." He will tell you who runs Dawnstar, should you ask: "That would be Skald the Elder. He's been running Dawnstar ever since he was a boy, and he never lost that brat's attitude. Turned on the Empire first chance he got. Now we're all part of this rebellion." If Dawnstar is taken by the Imperial Legion, Leigelf will instead reply: "Brina Merilis came in with the whole damn Legion and deposed Skald. Couldn't have happened to a better man."